Amidst deep uncertainty about its future as a public company, BlackBerry is launching a new flagship smartphone. 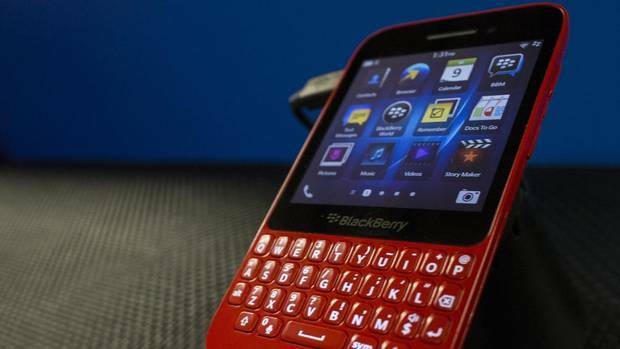 The Waterloo, Ont.-based smartphone maker introduced on Wednesday the BlackBerry Z30. The five-inch touchscreen device comes with myriad new features, including stereo speakers, a 1.7-gigahertz processor and “priority hub” software that learns a user’s most important contacts and conversations and collects them in one place. BlackBerry will begin rolling out the Z30 next week through its global carrier partners, starting in the United Kingdom and the Middle East and expanding to other markets in the lead-up to the holiday season. The company did not provide pricing information for the new high-end device. According to a BlackBerry press release, the new phone will eventually be available in Canada through Bell, Telus and MTS, with more carrier partners to be announced in the coming weeks. The Z30 “rounds out the BlackBerry 10 portfolio and is designed for people looking for a smartphone that excels at communications, messaging and productivity,” said Carlo Chiarello, executive vice-president for products at BlackBerry. The Z30 is the fourth device launched this year as part of the company’s new “BlackBerry 10” line of products. Earlier this year, BlackBerry launched the touchscreen Z10 and keyboard-equipped Q10 to positive critical reviews but unimpressive sales. This summer, the company also unveiled the Q5, a cheaper version of the Q10 aimed initially at overseas markets. So far, none of the BlackBerry 10 devices have proven to be commercial successes, and it is unclear whether the Z30 will do better, especially as it will hit stores at around the same time as two much-anticipated smartphones from Apple, the high-end iPhone 5S and the cheaper iPhone 5C. The new device also comes during what is perhaps the most tumultuous period in BlackBerry’s existence. For weeks, speculation about the company’s future has shifted to high gear, after BlackBerry announced the formation of a board committee to explore all strategic options, including an outright sale of part or all of the company. So far, no buyer has publicly expressed interest in buying BlackBerry, even as the company tries to complete the strategic review as quickly as possible. In the meantime, sales of BlackBerry smartphones have been on the downswing, in part due to uncertainty among enterprise and consumer purchasers about the company’s continued existence. BlackBerry reports quarterly earnings next week. Those quarterly numbers will give the most detailed view yet of how hard the company has been hit by declining sales. Share Your Problem about smartphone and windows Phone Network Carrier. Anybody can ask about your handset (Blackberry, iPhone 4 4S 5, Samsung, htc etc. ).